Sewer cameras are one of the most valuable tools in the plumbing and drain cleaning industry. Specifically designed to allow technicians to visually inspect the inside of pipes in real-time, sewer cameras are used to identify the cause of plumbing and drainage issues. Whether its root infiltration, pipe breaks, or pipe bellies, sewer cameras pinpoint the exact location of the problem for quicker, more accurate resolution. Sewer camera inspections are typically performed by trained Sewer Experts. After the initial line has been opened, the camera is inserted into the pipe and fed through the line. Sewer cameras are flexible, so that they may follow the path of the piping. While the camera is progressing through the pipe, footage is transmitted back to the Sewer Technician in real time, allowing them to see the pipe condition on their monitor. Sewer camera inspections are typically performed when there is a problem in the home, as preventative maintenance, or during home sale transactions. Accurately Locating & Diagnosing Issues – The greatest benefit of a sewer camera inspection is the ability to locate the exact cause and location of the sewer problem. Previously, entire lines were excavated to identify where and what the problem was. Less Costly Repairs – Accurately identifying and locating the source of a sewer problem allows for better diagnostics, and ultimately less expensive repairs. In many cases, spot repairs may be possible – whereas without a camera inspection the full sewer line may have previously been replaced. Early Problem Detection – Camera inspections don’t only assist in diagnosing existing sewer problems, but can also be helpful in revealing potential problems before they become major headaches. Take for example one of the leading causes of sewer line failure: root infiltration. By identifying minor root infiltration early on, you are able to take corrective action. When not identified and mitigated, over time root infiltration can cause complete sewer line failure. 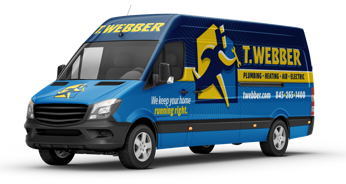 Whether you have existing problems you need resolved, are hoping to perform preventative maintenance, or want to ensure your new home won’t come with any “surprises”, call T.Webber today. Our Sewer & Drain Experts can visually inspect your sewer lines, present any options and findings, and give you peace of mind. Our staff provides professional sewer camera inspections throughout the Hudson Valley, including: Dutchess, Putnam, Westchester, Orange, Ulster & Rockland County.